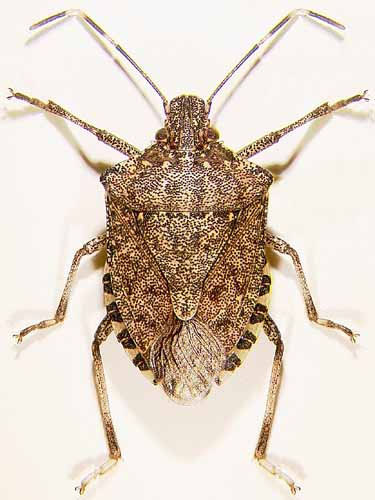 The brown marmorated stink bug (BMSB), Halyomorpha halys is an introduced, invasive insect new to North America. It was first identified in fall 2001 in Allentown, PA; though unconfirmed reports go back as far as 1996. The accidental introduction was possibly via shipping containers from Asia. The BMSB has been reported in several mid-Atlantic states, Oregon and California. To date, no one has reported this insect in Iowa. The closest documented infestations are in Chicago and Kentucky. We are anxious to know when this insect arrives in Iowa. If you find a stink bug that emits a bad odor or is unfamiliar to you in your home, please contact the ISU Plant and Insect Diagnostic Clinic or your local Extension office. BMSB feeds on sap from a long list of host plants including many fruits, vegetables, field crops, shade trees and other woody ornamentals. In addition to the considerable damage done to crops, gardens and landscapes, the adults have the disturbing habit of migrating to house and other buildings in the fall to overwinter. Homeowners on the east coast describe the stink bug invasion as worse than boxelder bugs and lady beetles, combined! 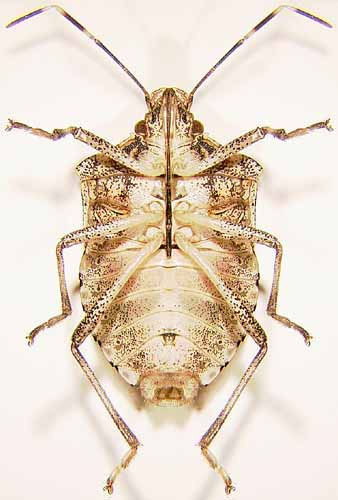 Description (from Rutgers University): The brown marmorated stink bug has a "shield" shaped body that is characteristic of all stink bugs. The adults are approximately 17 mm (5/8 inch) long with a mottled brownish grey color. ["Marmorated" means marbled, a description of the mottled color on the back.] The next to last (4th) antennal segment has a white band and several of the abdominal segments protrude from beneath the wings and are alternatively banded with black and white. The underside is white, sometimes with grey or black markings, and the legs are brown with faint white banding. Please stay in touch and let us know of any suspicious specimens. Brown marmorated stink bug. Note the banded antennae and the alternating light and dark areas on top of abdomen. Photo by D. Shetlar, Ohio State University Extension Entomology. Underside of brown marmorated stink bug. Note the light color. Photo by D. Shetlar, Ohio State University Extension Entomology. Have you seen this stink bug?